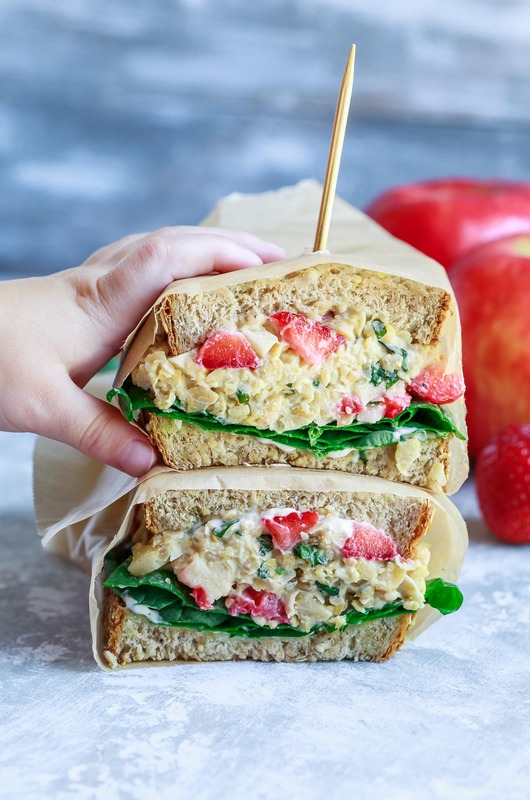 This Strawberry Basil Chickpea Salad Sandwich makes a tasty (and portable!) lunch for work, school, or home. Even better? It’s quick, easy, and healthy too! Man this one is long overdue! So! Anyways! I have this not-so-little recipe journal tucked into notes app on my phone. It started out innocently enough as a means of writing down the random ideas that would pop into my head while driving, traveling, or sleeping. Now it’s like full blown beastmode up in there. I have to periodically lump the notes into categories so I can find them when I’m recipe testing but really, it’s just a complete and utter mess. I’ve had “do some sort of strawberry salad sandwich thing with basil and chickpeas” on that thing for literally like a year now. Every time I would scroll past it I’d get this crazy hankering for this crazy @$$ sandwich and vow to make it. Every time I completely let myself down. I finally. FINALLLLLYYYYYYY got to tinker in the kitchen and fell head over heels in love with the results. 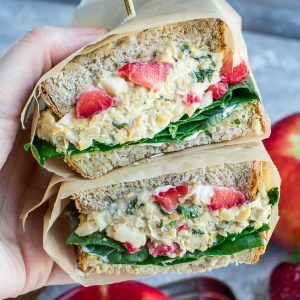 This Strawberry Basil Chickpea Salad Sandwich is everything I hoped it would be and I’m so super excited to share it with y’all today! 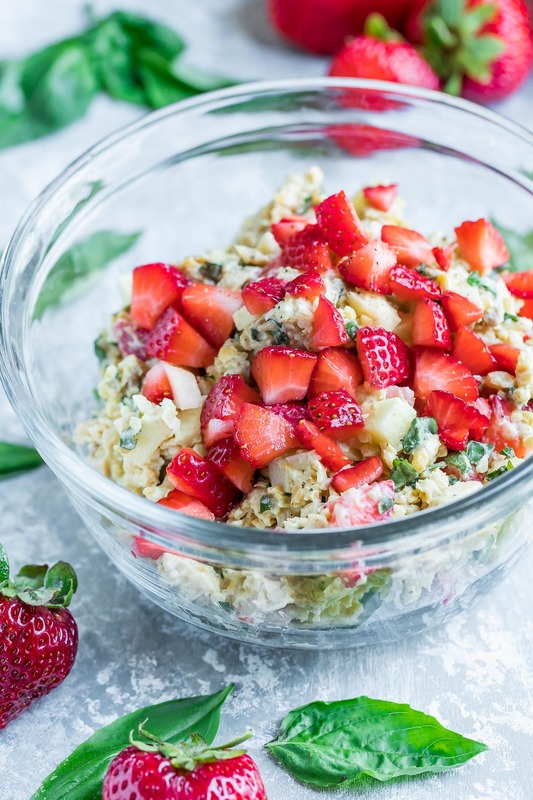 This sassy strawberry spiked salad is great every which way! You can serve it on a buttery bakery croissant (my FAVORITE! ), whole grain bread, lettuce wraps, salads, or even with crackers and crudities. 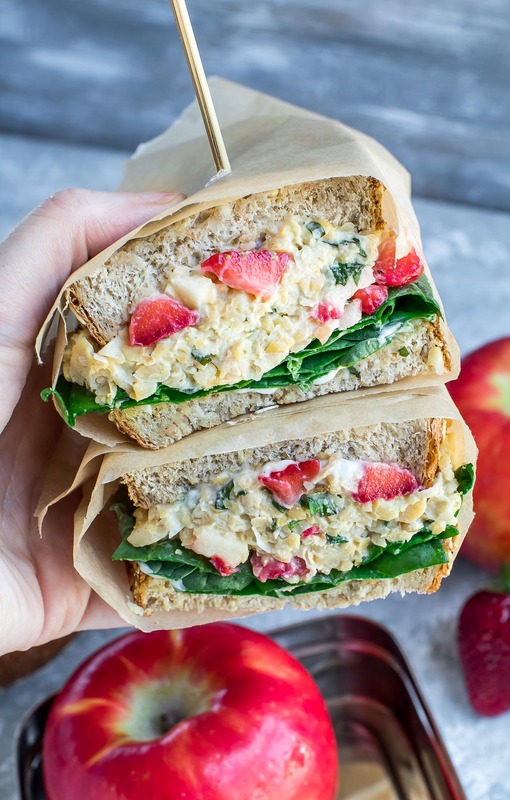 This Strawberry Basil Chickpea Salad Sandwich makes a tasty (and portable!) lunch for work, school, or home. Even better? It's quick, easy, and healthy too! 1/2 cup chopped strawberries or add extra! Drain and rinse your chickpeas and add them to a large bowl. Mash with a potato masher or fork until texture appears flaked, almost like tuna salad. You could also use a food processor as a speedy shortcut - it works GREAT! Add mayo, dijon, yellow mustard, salt, and pepper to your chickpeas. Stir well to coat. Fold in celery, apples, berries, sunflower seeds, and basil (as much or as little as you'd like) and adjust any ingredients or seasoning to taste. Love balsamic? Before adding your top slice of bread, drizzle this strawberry chickpea deliciousness with balsamic glaze for a kiss of savory sweetness. Big thanks to my pint-sized hand model for helping me with this shoot and for accepting payment in the form of strawberries and bread. Ooh! I know I know I mentioned it in the recipe card itself but you guys have gooooot to try this on a buttery soft bakery croissant if you can! Holy cow! I loved it on whole grain but that croissant combo was flipping legendary, yo! I can’t wait to make it again! 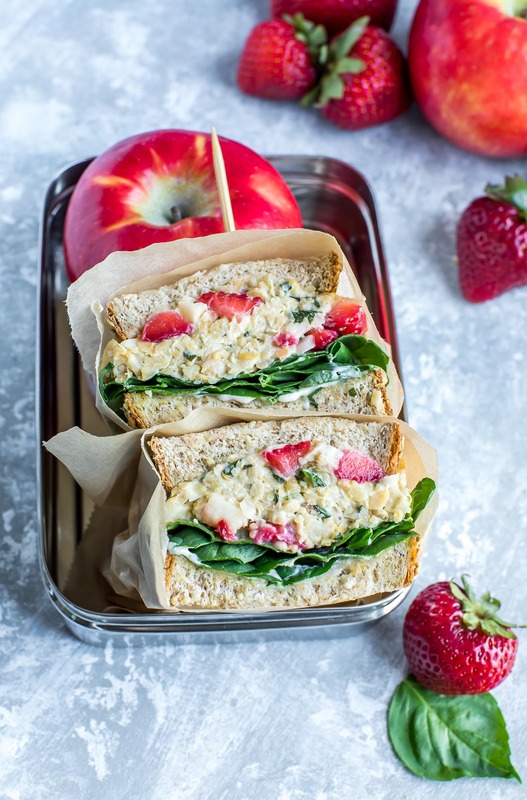 You know, I’ve never put strawberries in a sandwich before but this has got to be one of the most delicious looking and sounding sandwiches I’ve ever seen. So excited for you to try it Helen! It’s a family favorite over here! I love Chickpeas and am always looking for new ways to use them! This is exactly what I never knew I needed. So delicious! I could legit eat this forever! Does the chickpea mixture for sandwich keep over night? Hey Deb! It sure does! The strawberries soften a bit more by the second day but the flavor is still spot on. This was delicious! Thanks for such a great recipe. I’m guessing the celery gets added with all the other chunky stuff in step 4? This is the first chickpea salad stuff I’ve ever made. I’m not sure I mashed them enough, as they were still pretty chunky when I gave up. I wasn’t too enthusiastic about the resultant product–until I added the balsamic glaze. That did wonders! Really brought everything together and made it something special. I served it on a whole wheat and flax flatbread type thingie with some lettuce and extra strawberry slices. Maybe I’m just not a huge fan of basil, though. I did try adding extra basil leaves in my first wrap and wasn’t particularly pleased… I also went all-in with the 4 T of basil in the salad itself, though. I’m just not very good with herbs and spices. I generally can’t tell what’s what, and I have virtually no idea what they add to things. 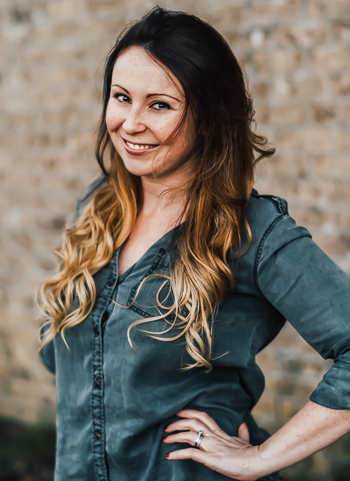 lol I just put into things what recipes tell me to… Thanks for the recipe! I will definitely continue to explore chickpea salads. I just wanted to point out that step 3 calls for dill to be added, which isn’t in the ingredients list. All fixed! Thanks Sherwood! 🙂 I created the recipe based off my garden veggie chickpea salad (which is made with dill) and completely missed leaving that step in – much appreciated. Happy to help. 🙂 Proofreading is the least I can do in return for the recipes you blogger folk provide me.